The Garmin GPSMAP 64st is a handheld GPS device which is ideal for walking, hiking, biking and more. The GPSMAP 64st has a 2.6-inch colour screen and has a GPS and GLONASS receiver for superior satellite connectivity. It comes preloaded with full European topographical mapping and a worldwide shaded relief basemap. With this GPSMAP 64st you also get an altimeter and 3 axis compass. This GPSMAP 64st also connects wirelessly to your smartphone and via ANT+ which enables Live Track and Smart notification. You can power the GPSMAP device using either a power pack or AA batteries for a battery life of up to 16 hours. You can add additional mapping to this GPSMAP 64 for recreational use, driving, use on water and more. It is also perfect for paperless geocaching as it will record location, terrain, difficulty, hints and descriptions. The equivalent and replacement model is the GPSMAP 66st. You can however still buy accessories and maps for the GPSMAP 64st. Garmin GPSMAP 64st is a slim, lightweight handheld GPS device built to navigate you along walks, over rough terrain, on your bike ride and more. It has a 2.6-inch sunlight readable colour screen and has a GPS and GLONASS receiver with a quad helix antenna for quick acquisition of satellites and it will maintain its GPS fix. The GPSMAP 64 will even maintain its GPS connection in thick woods, deep valleys and when amongst tall buildings. It is preloaded with topographical maps of full Europe and also a worldwide base map with shaded relief. You also get turn-by-turn navigation along trails and paths whereby routes are calculated tailored to the leisure or sport activity. The GPSMAP 64st is also equipped with an altimeter and 3 axis compass. It has been built to be used in many conditions including when wearing gloves, cold and wet environments, etc.. It has a button interface for quick, easy control and has been built to be rugged and waterproof to IPX7 standards. The GPSMAP 64st can be powered with either the battery pack or AA batteries and has a battery life of 16 hours. The GPSMAP 64st connects wirelessly to your smartphone and via ANT+ which enables Live Track and Smart notification. There is also a microSD card slot that is used to add further mapping capabilities to the device. There is also 3.5GB of internal memory to store information. Mapping you may want to add to the GPSMAP 64 include Topographical maps for navigating countryside, hills and mountains and GB Discoverer ordnance survey 1:25k or 1:50k are for walking, hiking and biking. Furthermore marine maps are perfect for use on the water and City Navigator maps are available for navigating you on road. You can also get Garmin Custom Maps which convert both paper and electronic maps for use on your device. It is also preloaded with BirdsEye Satellite Imagery with a 1 year free trial subscription. The GPSMAP 64st is perfect for geocaching and many other activities including walking, hiking and biking adventures as it allows you to record information about geocaches such as location, terrain, difficulty, hints, descriptions. It thus supports paperless geocaching and correspondingly can store 250,000 preloaded caches, hints and descriptions. You can also store waypoints, tracks and routes off the beaten track. There is also a TrackBack feature that enables you to navigate back where you came from. The GPSMAP 64st also offers further functionality. You can display and enter coordinates in British Grid format like the grid used on Ordnance Survey maps. Topographical maps can be viewed in 2D or 3D on a computer and it will show contour lines and elevation profiles. What's more BaseCamp software enables you to organise maps, waypoints, routes and tracks on your computer before you set off on your journey. Then you can also share with friends, family and fellow explorers your routes and waypoints using Garmin Adventures. Do you have a question about the Garmin GPSMAP 64st or other handheld GPS related question that's not been answered on this webpage? Please see our handheld and Outdoor GPS FAQs page for questions from other customers.Plus if the answer to your question isn't featured, use the online form to ask us for the answer. Alternatively please telephone 01733 777623 Monday to Friday (9:30am-5:00pm) to speak to one of our sales team. For further information online please see the Garmin GPSMAP comparison table. Garmin GPSMAP 64st is preloaded with a worldwide basemap with shaded relief and topographic maps for Europe. Please note: Additional maps can be loaded to the GPSMAP 64st. The GPSMAP 64st features a SD/microSD Card slot, an easy way to add new maps and mapping updates. Looking for accessories to use with the Garmin GPSMAP 64st handheld device? We sell a vast selection of genuine parts and spares including GPSMAP 64st slip case, retractable lanyard, carabiner clip, battery charger, bike/handlebar mount, Garmin Tempe and chirp Geocaching Beacon. Garmin GPSMAP 64st is preloaded with a Worldwide basemap with shaded relief. However, a number of other maps supplied on SD/microSD Card are also compatible including street-level road maps - perfect for cycling of using your GPSMAP 64st in a car, 1:50k and 1:25k Ordnance Survey maps - ideal for hiking and walking the countryside of Great Britain and marine BlueCharts - ideal if you want to navigate the waters around the UK, Europe or further afield. SD card out in this unit? I use a topo map most of the time. Answer: Yes, it is possible to switch between a map e.g. City Navigator on SD/microSD Card and a preloaded map e.g. TOPO on the device. To do this you simply go into the GPSMAP 64st map menu and tick or untick maps as appropriate. Please refer to the instructions for further details. Question: I would like some GPS mapping for my GARMIN GPSMAP 64st of the Alps for Ski Touring - however I do not really want to spend £120 on the whole of the Alps. I am specifically interested in Les Deux Alps (IGN Map 3336ET) - are you able to produce digital mapping as per the paper maps at a lower cost (i.e. per map)? Answer: Unfortunately we are unable to produce TOPO mapping for a smaller area. We retail the maps that Garmin produce and Garmin themselves don't produce a map covering small individual areas of the Alps. 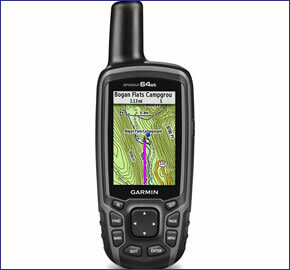 Do you have a question about the Garmin GPSMAP 64st? Submit your question via our contact page.